Orange Blossom Arrangement from Amaranthine Flowers By Design, has a gorgeous mix of tropical and native flowers that are sure to please. 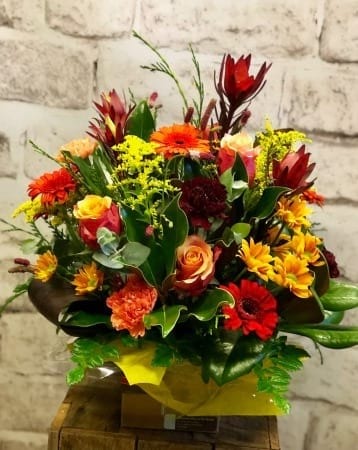 A unique design with carnations, orange gerberas, native leucadendron, roses, Chrysanthemums and with modern foliage. A striking design to compliment any home, office or hospital room, say thank you with the Orange Blossom from Amaranthine Flowers By Design. Your local florist in New Lambton, Newcastle.